Wrestlemania 9 was held in Las Vegas, and I believe was the changing of the guard for the annual event. Even though Hulk Hogan ended up walking out as WWF champion without even being booked in the title match, the card itself was like no previous Wrestlemania. Former WCW stars dominated the lineup. Lex Luger, the Steiner Brothers, the Diamond Stud (Razor Ramon), and El Gigante (the Giant Gonzales) all played a part on the show. Jim Ross had just left Atlanta and was on commentary for the event. Randy Savage, who just a year earlier had won the world title, was a part of the announce team too. This was also the first outdoor Mania. Bret Hart lost the WWF title to a much larger Yokozuna, who immediately dropped the belt to Hogan. By this point I was no longer a Hulkamanic and questioned the decision. Hart in my opinion was screwed that night. Hogan would be gone from the company just months later. One of the other standouts to me was the appearance of two Doinks. I must admit, I was a fan of the devious clown. When the second one emerged from under the ring and whacked Crush with a bogus arm, I marked out. Turning Doink a face was a huge mistake in my mind. Ramon scored an impressive win over former champ Bob Backlund. The Narcissist Lex Luger showed Curt Hennig who was the perfect one that night. And Shawn Michaels nearly liar the Intercontinental title to the undefeated Tatanka. 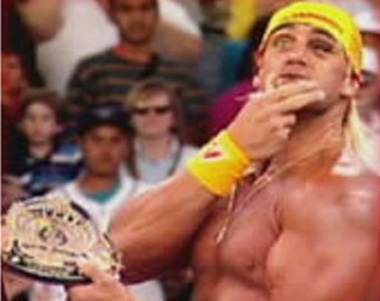 Hogan and Brutus Beefcake got disqualified in their quest to win the tag team titles from Money Inc. Yes the tide started to turn with Wrestlemania 9. And despite the disappointing outcome of the main event, it was still a fun night. What are your thoughts on the event? Post here or on Facebook.